Alan T. K. Lee, Donald J. Brightsmith, Mario P. Vargas, Karina Q. Leon, Aldo J. Mejia and Stuart J. Marsden. 2014. Diet and Geophagy Across a Western Amazonian Parrot Assemblage. Biotropica 46(3): 322–330. We identified species- and community-level dietary characteristics for a species-rich Amazonian parrot assemblage to determine relationships among dietary metrics and use of geophagy sites. Previous studies suggest that soil is consumed at geophagy sites in this region mainly to supplement dietary sodium. We accumulated 1400 feeding records for 16 parrot species over 2 yr and found that seeds, flowers, and fruit pulp featured prominently in diets, while bark, insects, and lichen were consumed in small quantities. Food availability across 1819 trees was measured, and we found that flower availability was highest in the dry season and fruit production peaked in the wet season, but that phenology patterns of the 20 most commonly foraged plant species suggest no serious food bottlenecks. 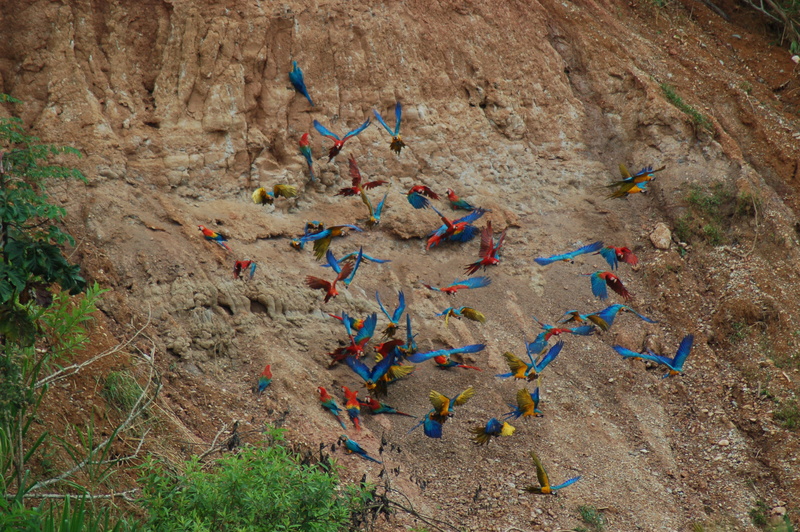 Partitioning of available food resources among the 13 most commonly encountered parrots is suggested by an ordination analysis (DCA), which placed the large macaws (Ara) with the Amazona parrots at the ‘primary forest’ end of a dietary resource axis and four smaller species at the ‘successional forest’ end of the axis. 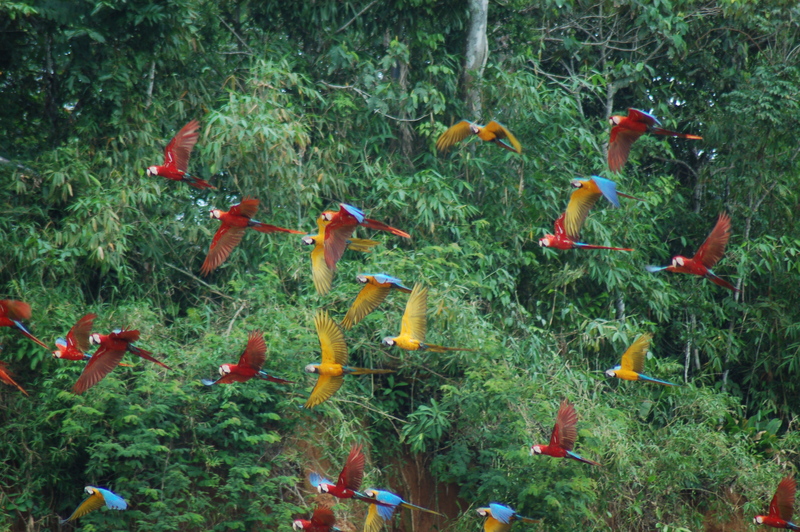 Parrot species associated with successional forest also consumed less plant species overall. Furthermore, these parrot species consuming successional forest resources had higher claylick visitation rates than those consuming primary forest resources suggesting they derive the greatest benefits from soil consumption.